Hello Ladies and Gentlemen, I have an announcement to make: I finally registered for the Dubai marathon!! I mentioned in many recent posts that I was training for it, but never told you that I wasn't actually registered. The simple reason for that was that I wasn't sure if I could get myself to run it. Two days ago I did a 29k/18miles run in which I had to run progressively faster towards the end, for about the last 40 minutes. I was on the road for three hours. After that run I decided that I can do a marathon, with just a little more training. My thighs are still a little tight and sore, but hey, 29k/18 miles are not exactly a walk in the park, right? So now I am registered, and I am very much looking forward to it. All doubts are swept away and I will run this marathon. Tonight I am gonna meet my running group. Runners can do either 2 or 4 miles. The run has race character, although it's a fun thing. I am gonna do my 4 miles and see if I can improve my time from last week, although I can still feel the 3-hour run in my legs. I must say I have been watching my nutrition very carefully since I started the marathon training. I like to believe that it contributed positively to my performance, will power, and recovery after the runs. No refined sugars or flours or processed foods. Lots of raw foods and fresh ingredients. Now here is my latest creation: after making my almond butter granola bars I was intrigued to make almond butter myself. I found out, nothing is easier than that. Perhaps the rest of the world knows that. 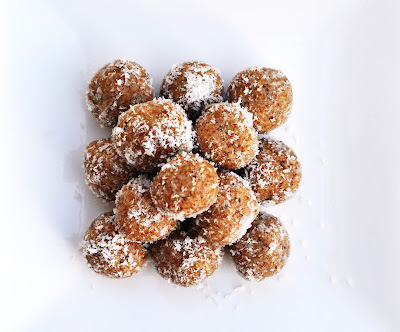 It never occurred to me that this was something you make yourself at home: Put the raw almonds in the food processor and process for some 25 minutes, and there you go. I was watching my food processor doing my almond butter like kids would watch elephants in the zoo: with absolute amazement and joy. Once the butter has the desired creamy consistency, just throw in some sweetener, spices or flavors. I went for cinnamon, figs, coconut and honey. Ready is your raw and guilt-free dessert. In a food processor, combine almond butter*, figs, 1/4 cup dried coconut flakes, cinnamon and agave/honey. Blend until well combined. If the batter seems to dry to form balls, add a teaspoon of water and blend again in the food processor. 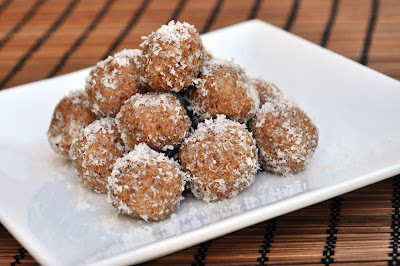 Form balls of the size of a cherry, then roll in dried coconut flakes to coat. Place in mini muffin liners. Keep in airtight container at room temperature or in the fridge. Place 1 cup of almonds into the food processor. Blend for about 25 minutes (yes, 25!!! ), until texture becomes creamy. It is important to regularly wipe the sides of the food processor. Process, wipe sides, process, wipe sides. You'll get about 1/2 cup of almond butter out of a cup of whole almonds.